Don’t miss this chance to visit with the Easter Bunny at Waterside Shops, the Gulf Coast’s premier shopping and dining destination, presenting the 2019 Easter Egg Hunt Eggstravaganza, from 9–10:30a.m., Saturday, April 20th, 2019, at 5415 Tamiami Trail N, Naples, FL 34108. 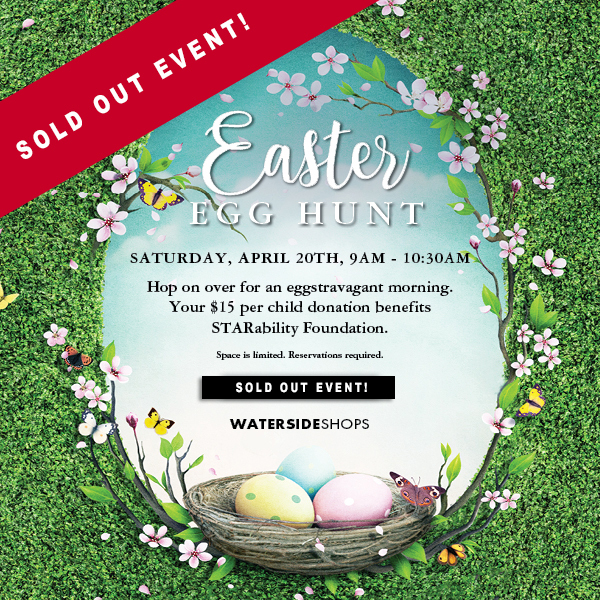 This is a pre-registration only event, the 10th annual Waterside Shops Easter Egg Hunt Eggstravaganza features a visit with the Easter Bunny, an Egg Hunt, and other fun activities! The $15 per child donation ticket benefits STARability Foundation and our life transforming programs and services. The Easter Eggstravaganza is a by-reservation-only event. Limited spots are available. For more information on Waterside Shops, activities and events, please visit www.watersideshops.com.